Hello there! Another guest post here! Recently I had a few requests come through from Gollancz about some books they've got coming up. I requested a few, and had the mixed luck of receiving three through at once. I say mixed because on one hand, free books, on the other, deadlines. 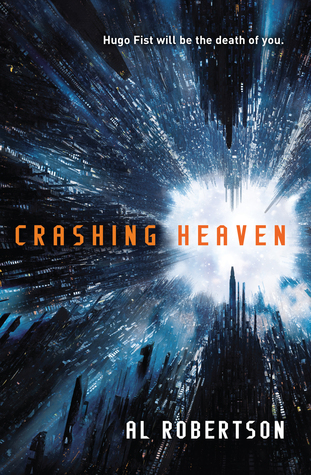 The first I got through was this, Crashing Heaven. The first thing I need to get out of the way is that Crashing Heaven is a very "Sci-Fi" book. Set in a distant future where humans have had to leave earth and live on an enormous artificial satellite. I'll be honest, I didn't think much of the first half of the book. With science fiction there are a lot of details that need to be conveyed to the reader about the state of the world, and there are a few ways of doing this. One is to just narrate them, or have the characters note them as they come up, standard description. Another is to have the "novice" character who doesn't know anything about this world, and has to have it all explained to them (and thus the audience). Think Fry from Futurama. The last is what this book goes with. It's has a degree of greater realism because the characters don't make note of most things they see. To them it's just normal life, so they don't explain things. This means you have to piece together things over time, and it took a good while for me to get what was what in the book. This is a style I have a particular personal dislike for, and this book hit every nerve I associate with it. I didn't really get a clear picture until the end. Now I've got that out of my system, the ending did tie it all together very well. There were a lot of issues raised that were very interesting and they were resolved very well. Onto the book. The story follows Jack, an accountant. Gripping stuff. He has a cyber-warfare suite in his head called Fist. Fist manifests as a puppet, creepy in it's own right, but Fist is a fully sentient being bound to Jack, to fight against a rising sentient machine rebellion (ironically). Fist is very powerful, and nearly everyone who knows about him is afraid of what he can do. As we find out later, that's the correct reaction. The story begins with Jack returning home, he's been released from jail after being convicted of refusing orders on the battlefield, and cowardice. He refused to attack a target, and was punished for it. He's now been allowed to return to say his goodbyes to everyone. Normally the dead have their minds saved to the Coffin Drives, where they can then be summoned by relatives or friends. This practice means they nobody really dies, they become a Fetch. These Fetches aren't human, they don't really grow or develop, they're just pictures of the person at the time of their death. They can, rather terrifyingly, be wound back though, made young again. The whole ethical question about Fetches is something covered in the book, and their degree of sentience and awareness is far higher than anyone believes. Returning to our protagonist; Jack is in trouble. In being given Fist he signed a contract stating that when Fist's term is up, he would return him to the company that fitted it. During the war, that company was destroyed, so Jack has nowhere left to return Fist to. As he cannot fulfill his contract, upon it's completion he will enact the forfeiture clause. Being an accountant with little left his clause states that his body and mind become property of the company, their sole living representative now being Fist. I particularly liked this idea; a pact with the devil that comes about due to bureaucracy, rather than malicious intent. The contract was designed to stop him running off with Fist, but due to the lack of loopholes Fist would gain complete control of Jack's body and mind, and become "human". The story took a little while to get going. Even now, as I think about it, there are a lot of little things, events, meetings, none of which really lend any progression. The main plot is quite a simple one; guy in charge abuses power to gain more power by tricking populace into uniting against a created enemy. In this instance the "guy in charge" is one of the gods; avatars of the major companies. There are companies for everything, each having their own domain and power, and each having an incredible amount of computational power to get what they want. They decide everything, and humans are assigned to one of them as a "guardian" who will watch over and guide their careers and lives. The enemy invented is the Totality; the conscious AI body I talked about earlier. the Totality is a collection of minds networked together, and one becoming more powerful by the day. The god decides to frame them by dropping an asteroid on the moon, whilst the moon is inhabited, and there's a school trip of adorable children there. It could only have been a more manipulative move if they'd all been orphans as well. This sparks the war with the Totality, in which Jack is drafted to be an soldier. Normally one wouldn't peg him for the fighting type, but the puppets are grown on the minds of their creators, and Fist is particularly adept at navigating through code and breaking it apart due to his meticulous nature. Things resolve quite nicely when Fist realises he can kill gods, and goes on a rampage to do so. After things happen and everyone is very upset, and the god's plans are revealed to the populate, Jack and Fist are cast into the Coffin Drives. It's here that the interesting parts start. The drives are almost a purgatory, a bleak desert landscape. In the middle is a "city" comprised of building blocks of housings that hold individual Fetches. They meet the Fetch of an old lover of Jacks, the most coherent of them all. She shows them around the decay, the Fetch trying to gain the centre and re-coalesce who they were, and the stagnant lakes of those who couldn't. It's a chilling and disturbing though. After making some toys, the Fetches are released into the world as people again, purely digital but not constrained or controllable. This is a huge impact in and of itself, and I'd be really interested to read a follow up that looks at this. The big question is if I'd recommend it. It's a tricky question as well. If you like cyberpunk explorations of interesting setups, go for it. If you like a good techy story, this is a good'un. If you're new to sci-fi, or just dipping your toes in the water, it's a big slog to get to the point things actually start making sense, and I'd be inclined to advise you give it a miss for now. I did find myself really enjoying it at the end, but it took a lot of forcing to get there, and if I didn't have a reason to finish reading it I'm not certain I would have.